Texas-based Encrypted Email Service 'Lavabit' abruptly shut down for reasons linked to National Security Agency whistleblower Edward Snowden. The Feds want to Lavabit demanding access to Ed Snowden's email. 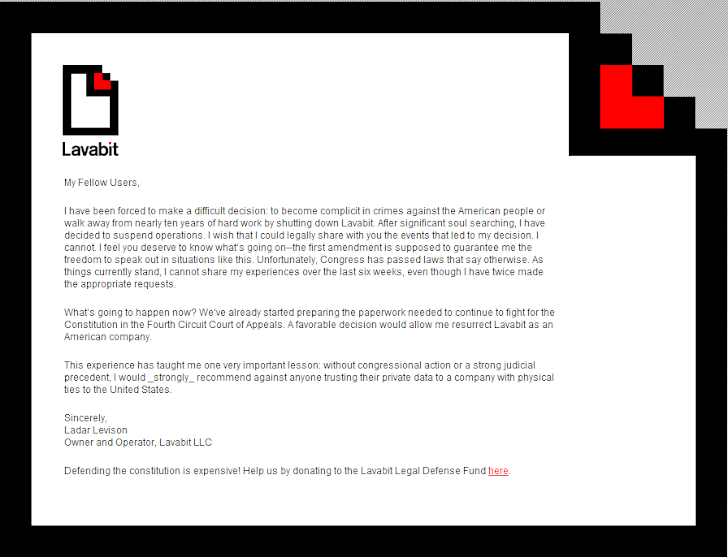 Lavabit refused! Snowden was using the Lavabit service while holed-up in the Moscow airport. Lavabit was a dedicated email service that offered subscribers "the freedom of running your own email server without the hassle or expense." Lavabit was launched in 2004 and most recently handled service for upwards of 60,000 individuals at a rate of around 200,000 emails a day. The owner of Lavabit announced "I have been forced to make a difficult decision: to become complicit in crimes against the American people, or walk away from nearly 10 years of hard work by shutting down Lavabit," letter posted on the Lavabit website. "This experience has taught me one very important lesson: without congressional action or a strong judicial precedent, I would strongly recommend against anyone trusting their private data to a company with physical ties to the United States," Levison wrote. Recently another Service 'Silent Circle', which makes software that encrypts phone calls and other communications, announced in a company blog post that they decided to shut down its Silent Mail feature. Silent Circle said it shut down its email service for both technical and political reasons. Levison is asking readers to contribute to his legal defense fund and support laws in Congress that permit greater transparency.